The H1 of FY19 saw the segment obtaining a strong double digit growth of 37.82 per cent which shrank to 3.3 per cent in the H2 of the fiscal. New Delhi: Commercial Vehicle sector, mostly a cyclical industry, for the first time crossed one million domestic sales mark in FY18 – FY19, even as the party seemed over in the second half of the fiscal. The segment was mainly driven by demand due to new infrastructure projects and fleet replacement. With a growth of 17.6 per cent, the commercial vehicle manufacturers dispatched 1,007,319 units from their factories across India in the mentioned period compared to 856,916 units in FY’18, says the latest data released by Society of Indian Automobile Manufacturers (SIAM). The top three players – Tata Motors, Mahindra & Mahindra and Ashok Leyland, which commanded more than 86 per cent of the market, grew at almost similar pace of 19 per cent, 15 per cent and 17 per cent respectively. This led to no major change in their market share during the period under review. “Due to swift transition to BS IV, there occurred a shortage of components to manufacture BS IV vehicle in the first quarter of FY’18 which along with GST implementation led to very low sales during the period. As a result the initial 4-5 months of FY’19 experienced very strong growth on year-on-year basis,” Shamsher Deewan, Vice President & Sector Head, ICRA told ETAuto. The growth rate in the H2 moderated mainly due to revised axel norms, liquidity crunch and uncertainties due to upcoming general elections. The axle norm increased the freight carrying capacity of medium and heavy commercial vehicles (M&HCV) by 20 per cent that led to lower demand for new trucks. What further trimmed the demand was the tightened liquidity scenario due to fall out of IL&FS. This led to NBFC becoming cautious in lending which also dented new purchases. Additionally, acute absence of new launches for a prolonged period in the last quarter further crippled the demand in the second half of the year. 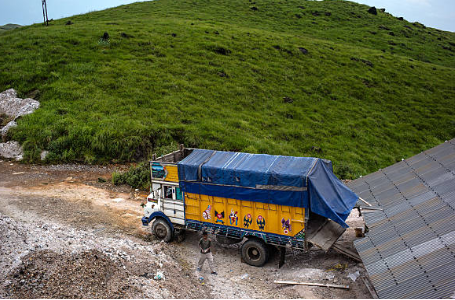 Within the segment, weathering the unstable regulatory and financial environment, the M&HCV segment climbed a growth of 14.6 per cent at 390,740 units in FY18-19, largely due to strong demand for tipper trucks from infrastructure and mining sector. According to research firm ICRA, the demand of cargo trucks started seeing volume contraction post the implementation of revised axel norms whereas the tippers trucks demand remained resilient showed a growth between 40-50 percent in FY 2019. Tata Motors, leading CV player, led the growth in the M&HCV where it reclaimed over 50 per cent of sub-segment segment’s market share pie after three years. It last captured a 53 per cent market share of M&HCV segment in FY’16. Tata Motors’ M&HCV sales increased by 17 per cent in FY’19 to 195,712 units. “Only cargo segment slowed down while the tipper segment has grown very well on the back of strong investment by the government in the infrastructure segment,” said Girish Wagh, President, Commercial Vehicle, Tata Motors. Not only this, the company also maintained pole position in light commercial vehicle (LCV) segment, where it grabbed 40.8 per cent market share at 251,611 units, defeating Mahindra & Mahindra (M&M). In comparison, M&M sold 236,377 units, witnessing a growth of 15 per cent with 38.3 per cent market which is a decline of 2 per cent in the market share. This is also the highest fall of market share by any manufacturer in the LCV segment last fiscal year. Although a late entrant in LCV segment, Maruti Suzuki doubled its market share from 2 per cent in FY’18 to almost 4 per cent in FY’19 with its sole product Super Carry. The company sold 23, 874 units of Super Carry registering a growth of about 135 per cent over the previous fiscal. Overall LCV segment recorded a growth of 19.4 per cent at 616, 579 units aided by sharp demand from the FMCG, e-commerce and last-mile transportation sectors. The sub-segment cut a 61 percent share of the total CV market in FY’19. Being more optimistic than ETAuto’s earlier projection of 8-10 per cent growth, SIAM forecast CV industry to grow at 10 to 12 per cent in FY’20. The growth projection is largely based on the expected pre-buying which will kick in during H2 FY’20 due to implementation of BS VI norms from April 1, 2020. Batra also believes that liquidity of NBFCs is likely to further improve in coming months which will ease the funding availability thereby providing a boost to CV sales.